Well finally, as promised, some blog candy up for grabs. I hope you will like what im offering. I have listed below exactly what is included. Depending on how much interest is shown in this blog candy i may add on to this candy. To enter please just leave a comment below and then link me to your blog advertising my blog candy. Thank you. 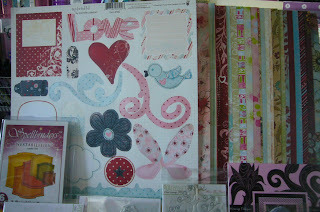 To see the fancy pants papers clearer you can to to the poppicrafts website as these are where they come from, its the valentine set, the paper set and the die cuts. what amazing blog candy! you are so generous darl! hope you get lots of replies...I am off to post a link to you on my blog. me again. I thought I was following your blog anyway....but seems I wasn't, I am now and I am number 100!!! Go you! Wow, what a generous blog candy. Thanks for the comment on my card. 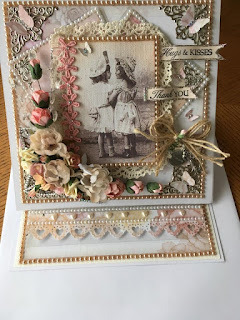 the atc was from a swap and it's lovely. will put a post on my blog. Well girlfriend I finally get on the net to go blog hopping and what do I find when I get to your blog!!!!!!! Some amazing blog candy!!! I have linked you dear to my blog hon. And have to say I LOVE your Christmas decorations dear. Awesome giveaway. Thanks for the chance to win it. I linked you on my blog. Wow Linda! What amazing candy!! I have posted a link in my candy Jar. I'm gonna make a post on my blog for it so you have a lot of vistits. OOh that is lovely candy you are giving away!! Hi, this is amazing candy! You have a lovely blog and i love all your christmas decs, your house must look very festive! Have a great christmas and new year and thanks for the chance to win. I'm off to blog now. Hi! I found you on Dawn's blog! This is a lovely giveaway that you are having! I'll add your blog candy to my giveaway post! What awesome blog candy! So very generous of you! Thanks for the chance!! Wow, firstly congrats on nearly reaching 10,000 hits, thats amazing! Also, great candy!! Just off to add you to my blog! Wow wow wow Linda what fantastic blog candy! Congratulations on so many visits to your blog that's great!! Have put a link on my blog, now keeping everything crossed! Congratulations with almost 10.000 hits! and what a great candy. I'd love to win it! I don't have my own blog, but I hope this will do. I wish you a very creative 2009! Fantastic candy Linda and very generous. Huge congratulations on your 10,000 hits. Thanks for chance to win. wow what fantastic blog candy thats so kind of you. Im off to link you on my blog now . Thankyou for the chance. Oh ive also got some candy up for grabs if you would like to enter? Thanks again. WOW,WOW,WOW......i could keep on WOWING,what gorgeous Blog candy you have up for grabs,the lucky person who wins this little lot will think they've died and gone to heaven. I've put a link to your Blog with a piccie in my sidebar,but really Linda i would much rather have kept it a secret...lol. Oh wow this is more than generous candy - I have linked you on my blog and will also be visiting your blog lots. WOW..linda this is great hun,what fab candy :-) congrats on reaching over the 9000 hits as well. would love to be in with a chance. Hi Linda, Congrats on all those hits and thank you for having such a generous candy and for the chance to win it. I have posted a link Here. Wow amazing blog candy you are so generous!!!! Hello! What's a candy! I've linked your candy on my sidebar under the section "Blog Candy". Thanks for a chance to win! Thanks for this lovely chance!! Oh wow, Linda, what amazing blog candy you have there! I will certainly post on my blog about it. Uuuu what a great candy.I linked you on my blog. WOW!! That is some fantastic candy! I have added a link to my sidebar. Thanks for the chance to win. Off for a look around now. Fabby candy,thanks so much for the chance to win.Have a fabby Christmas & a brill new year. I've added link on top of my sidebar! OMG Linda, what amazing candy - this is the best ever, you are sooooooooo generous, I would absolutly love to win. Hi there, Linda, I have some awards for you on my blog! Hi wonderful blog candy i would lvoe to go intoy uor draw thank you for the chance I have put a link on the side of my blog for you. and merry xmas to you all! What a wonderful selection of blog candy you are giving away. I have put a link on my blog. Have a lovely christmas. Blimey Linda....how much candy. Would love a chance to win, will link on my blog. You have already hit over 10,000!!! I am going to become your follower as your work is great. WOWZA! That is some Yummy candy!!! What a great blog you have here and some amazing blog candy that you're giving away. I'm going now to link your candy to my blog. Hope you & the family are well & that you all have a lovely Christmas! Wow, Linda, this is really generous candy, yummy! I gladly gave you a shout on my blog and listed you in my Candy blogroll! WOW that is some AMAZING candy! I would be honored to win that! I posted a link on my blog! You can see it here! What a super assortment of goodies, I am just drooling! Here's hoping you reach your goal! How great candy you put away. And how beatiful things you do. Wow - love that Fancy Pants!!!! I don't have a blog, but have posted on 3 of the Yahoo groups I belong to - hope that will count!! WOW, what great candy, I will pop a link on my sidebar now. what a great and fantastic blog-candy you´ve started!!! Wish you lots of hits and a nice weekend! How many hits did you say? oi... amazing! That's a beautiful selection of things for the candy. I'll bet it was fun to put together! Wow, that really is an amazing array of candy. I've been eyeing up those nestabilities for a while now so I have my fingers crossed. wwooowwww!! Waht a fantastic and amzing cady!! I ink you on my blog! Great blog candy ! I have linked you on my Candy Dish at the top of my side bar ! Thats amazingly generous candy. Thank you for running this. Wow I think you are going to spoil someone very lucky indeed!!! I would love to win this for my daughter. Will let everyone know about this on my blog. Wow what a fabulous blog candy. Thanks for the chance to win some gorgeous goodies. Hey, great blog candy, I love it! I just posted on my blog about this amazing blog candy! Wow Linda what fantastic blog candy! I will put a link on my side bar for you. This is a VERY generous blog candy, hope it generates lots of interest in your wonderful blog and so inspires those who look. Have put a link on my blog for you. 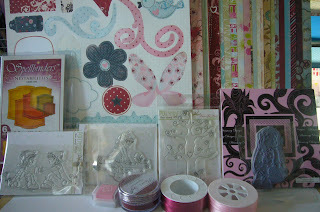 Wow, Linda, such a beautiful collection you have got together for blog candy :0)Thanks for the chance to win. Congratulations on getting so close to 10,000 hits! That's great! I've added your blog candy to my sidebar where I have others and I'll be posting today and make sure to include it in that as well. You can find mine here. Congratulations on your many many hits! WOW!!!!. Fabulous blog candy, your are very generous. Have put a link on my blog for you. Your blog candy is very yummy. Thank you for the chance to win it. Wow! An impressive selection of crafting goodies! Will leave a link to your blog on mine! That is some amazing blog candy and you have an enjoyable blog! What a generous offering! I'm going now to link you in my CandyBar at The Paper Freak. Hope I'm not too late. Great blog anyway. oh wow love the things you have listed. Please put my name in the draw. I'll post a link to you on my blog. Thank you for you very generous blog cady offer - fingers crossed. I love the blog candy, thanks for offering it! 10,000 hits is a lot! I cannot imagine. Best Wishes and Merry Christmas! What a lot of super yummy candy you are offering, hun! ; ) hope I am not to late! What a lot of hits you have had! AMAZING!! but not surprising as your cards are gorgeous!! Thank yOu!! I would love to win your wonderful blog candy. I'm now linking to you. Woweeee1 great blog candy! Hope I am able to join! You are a very generous lady and I will ink to y6ou tonght when I get a wee minute to myself!! What amazing blog candy! This is incredibly generous of you! I will add you to the Candy Jar on my blog. Your holiday decorations are lovely! Oh Linda my dear, what generous and gorgeous candy you are offering. I would love to win, going to put a link on my blog. I must do this myself, approaching 10,000 rapidly now! Fantastic candy - You are very generous! I have linked you on the right of my blog too. Love your work and thanks for the wonderful blog candy. I've got you linked. OMG what a blog candy....so very generous indeed. Cant wait to see how the lucky person is. Wow... what a stash of wonderful goodies ! Thanks for the opportunity ! Wow that is some candy you are giving away. Congrats on the hits! but your blog is awesome it doesn't surprise me that you have so many people interested!! What a nice stash of blog candy! Thanks for the chance to enter and I've placed a link to your candy on my blog. Woooow, what a beautiful candy! Hi Linda, what a great candy. Thanks for the chance to win. I post your candy on my blog. Hi, congrats for your hits! Nice Candy! Love the blog & I've linked you. What wonderful candy Linda and how very generous of you! I've posted a link to you on my blog candy sidebar. Absolutely brilliant candy! Hope you havae a happy and stress free Christmas! I am braving Tescos at 6 AM tomorrow morning!! (I work just around the corner!) I have linked you on my blog HERE . Good luck all and thanks for offering it Linda! Wow, what a great candy. Hi Sweetie, Thought I'd have a go at your most generous candy. I have added a link in my side-bar! Fabulous blog candy Linda, thank you for being so generous. I've posted about it on my blog here, now I've got my fingers crossed! Merry Christmas. Wowza! What blog candy...mmm...the way I figure, I have a much better chance at winning this then the lottery, so I'm definitely going to try! Beautiful blog too! Congrats on the hits! Am I lucky to be still in for a chance! 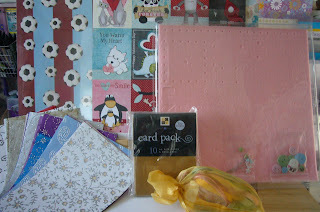 Wow....what an amazing giveaway of blog candy, thank you so much for the chance. I have put a link on my blog for you. So amazing things you have got! What a generous blog candy! Thanks for the chance to win! Congrats on your hits and merry christmas! What a lovely bundle of candy you're offering. Makes me feel like Santa has come. what great blog candy just love it. I hope you had a merry xmas and I wish you a happy new year!! congrats on your huge number of hits! That is such an accomplishment! Thank you for the blog candy offer! I've got my fingers crossed! What a wonderful blog candy prize you are offering. I have just found your blog by chance, but will be sure to visit again. Wow, I can't believe what you're giving away. You can see the post on my blog here. Thanks for the chance to win such amazing blog candy. You site is posted in my sidebar! Wow, Linda, that's awesome blog candy. I keep meaning to add my comment but what with having to travel through a bad snow storm for Christmas, I didn't have time. I sure hope it's not too late! Good going, girl. I love your blog! Wow! What fantastic candy and how generous of you Linda. I have posted a link on my blog. I can't believe how much fabby candy you have on offer for your candy! WOW what candy! Am I lucky 180? I've linked to you in my sidebar. Very very generous blog candy! Hope you had a wonderful Christmas and the New Year is full of happiness! Congrats on your number of hits. How exciting. Thanks for this chance to win. Krista P.
No seriously how wonnderfully kind of you Linnina.. Thank you for the chance to win such wonderful candy. I have linked you on my blog. Speechless. This is so genourous. Hope I win. I put a link on my blog. Hope I made it in on time.